The First Day of Spring my friends and if you look outside, a snowy one at that. Oddly enough, I do not feel cheated. It is what it is and I embrace it with openness. A theme of receiving weaved its way into my life this week and maybe some of my classes including our Restore series. We practiced with receiving the breath instead of taking a breath. How did that change the feeling in your body and mind to receive the breath. What sensations did you receive while practicing? For me, receiving whatever comes my way, has been a shift in my attitude. Some potential problems surfaced this week but I did not feel them as a problem only an opportunity. I believe it was in the way I received. I shared an affirmation with each of you at the end of class which I’ll include in this blog. Post it to your mirror or in your car. Anywhere you would receive the message the most. Benefits: Gently stretches the lower back, relieves shoulder tension and quiets the mind. Give a sense of security. Feeling support and release. Gently lengthens the legs. Place bolster on the mat lengthwise and lay a blanket over it. Make a smaller roll for the ankles and place at the other end of the mat. Also place a block at top end with a neck roll or eye pillow on top. Begin on all fours and lower your upper body onto the bolster. Settle the tops of the ankles on the smaller roll and adjust the body so that the tops of the thighs rest on the edge of the bolster. Lay the forehead on the cushioned block and place the arms to the side, shoulders dropping from the ears. Soften your jaw and let the body sink into the supports and the floor. Benefits: Gentle twist for the spine (quadratus lumborom) Releases stress on the back muscles and a stretch to the intercostal muscles. As muscles relax, breathing is enhanced. 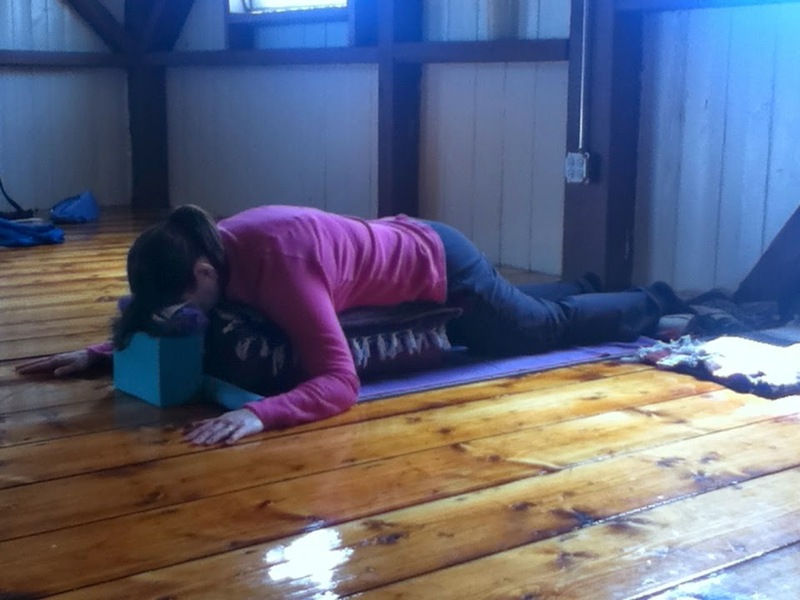 Set one bolster lengthwise on your mat. Depending upon your comfort, height can be elevated with blocks under bolster. Lay one blanket on top double-fold and one double-fold at end of bolster where your right hip will go. Sit next to bolster with your right hip touching it, bend knees, left or top ankle can lay in arch of right foot or other comfortable position for feet. For added comfort, place blanket between legs. Lengthen body over bolster, laying bent legs in one directions and upper body facing down on bolster. Arms drape down sides of the bolster.